73646 MAX SAAR (1952) Calvin*. 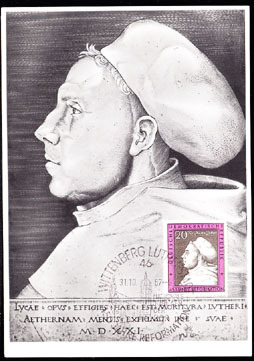 Luther*. Maximum card. Scott No B83, Yvert No 295. 73719 MAX EAST GERMANY (1967) Martin Luther by Cranach*. Maximum card with thematic cancel. Scott No 960, Yvert No 1014. 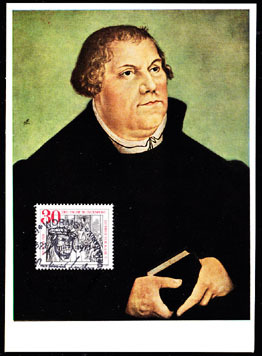 73593 MAX GERMANY (1971) Luther facing Charles V at Diet of Worms*. Maximum card with thematic cancel. Scott No 1063, Yvert No 533. 59296 SPE GERMANY (1987) Johann Bengel*. MUSTER (Specimen) overprint. Scott No 1509, Yvert No 1156. 63382 SPE GERMANY (1989) Nikolai church*. Specimen (overprinted MUSTER). Scott No 9N581, Yvert No 816. 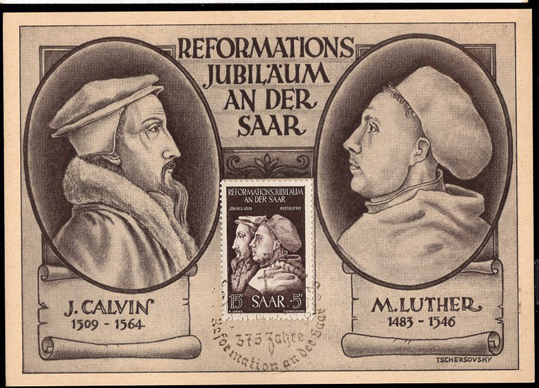 450th anniversary of Reformation.